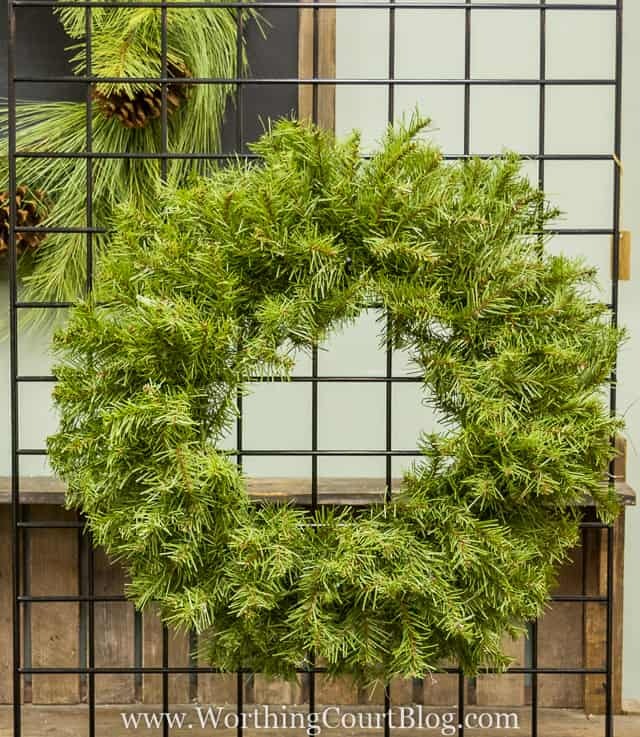 In this two part series, get step-by-step directions and secret tips from design pros for how to decorate a wreath for Christmas. There is a home decor store where I live, called Total Bliss, that is one of my favorite places to shop and to get decorating inspiration. 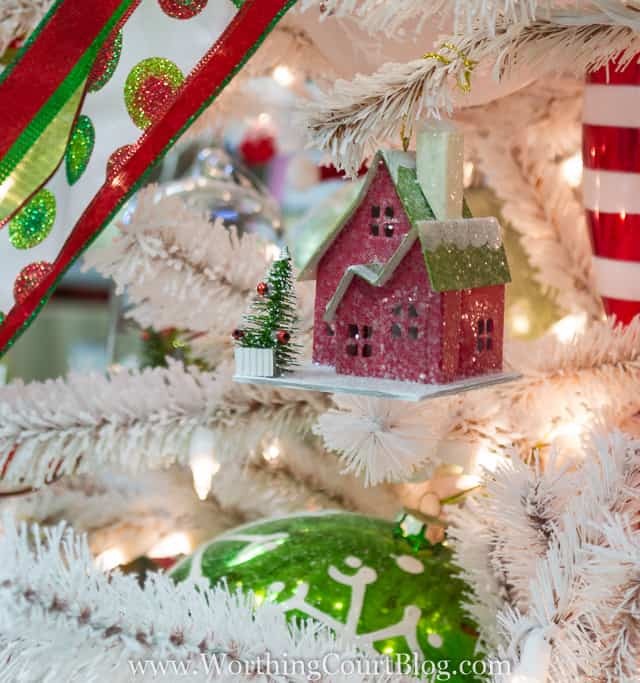 I shop there all year long, but at Christmas – on my, it becomes a wonderland! I recently had the absolute pleasure of spending time there while the store was being decorated for Christmas. Let me tell you – each and every lady who works there is extremely talented and you better believe that I soaked up every tidbit and tip that I could. I took a copious amount of photos and notes so that I could share with each of you. 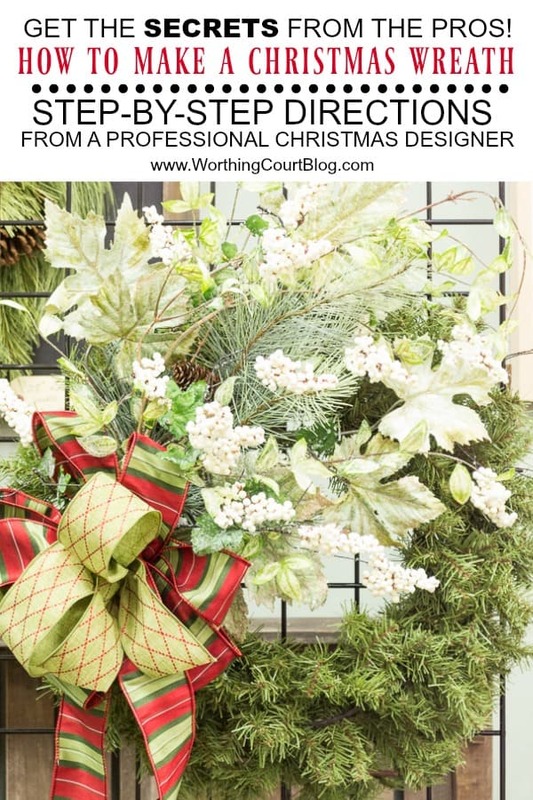 I recently shared the Designer’s Step-By-Step Directions for How To Decorate A Christmas Tree, but today I want to share all of the tips, secrets and how-to’s for how to make a Christmas wreath. The owner of Total Bliss, Nancy, was kind enough to make several different styles of Christmas wreaths and share all of her secrets with me. And of course, I have to spill the beans! We’ll start with basic tips that you can use no matter what size or style of wreath you make. Did you know that when the size of a wreath is quoted on the tag, it is the measurement from outer-most tip to outer-most tip when the wreath is fluffed out as much as it can possibly be? In other words, that 24″ wreath actually measures 24″ across, outside tip to outside tip. You’ll see why that’s a handy thing to know below. Yes, when it comes to wreaths, size matters. Generally speaking, you should use a 28″ – 30″ wide wreath on a 36″ wide door and a 24″ wide wreath on a 30″ wide door. 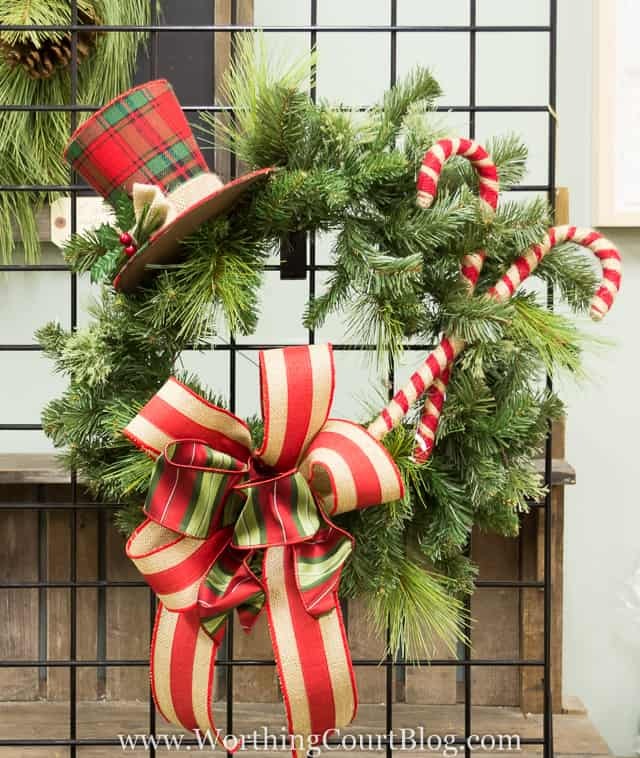 If you’re using a swag instead of a wreath, keep in mind that two swags work best on a set of double doors, but I’ll admit that I personally love the look of two matching wreaths. 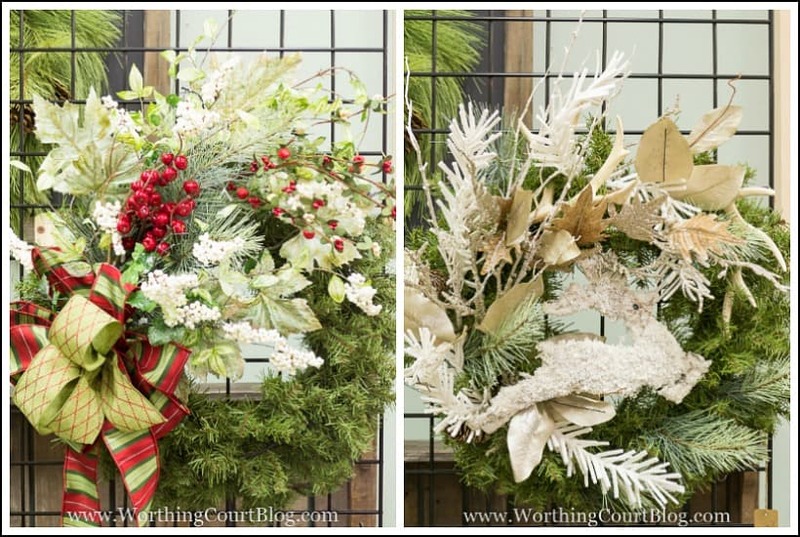 Before selecting a wreath, you should first decide what you’re going to do with it. Going to add lots of decorations? Then go for a less expensive wreath that you don’t mind covering up. It’s sort of a waste of money to spend a fortune on a wreath only to cover it with decorations. 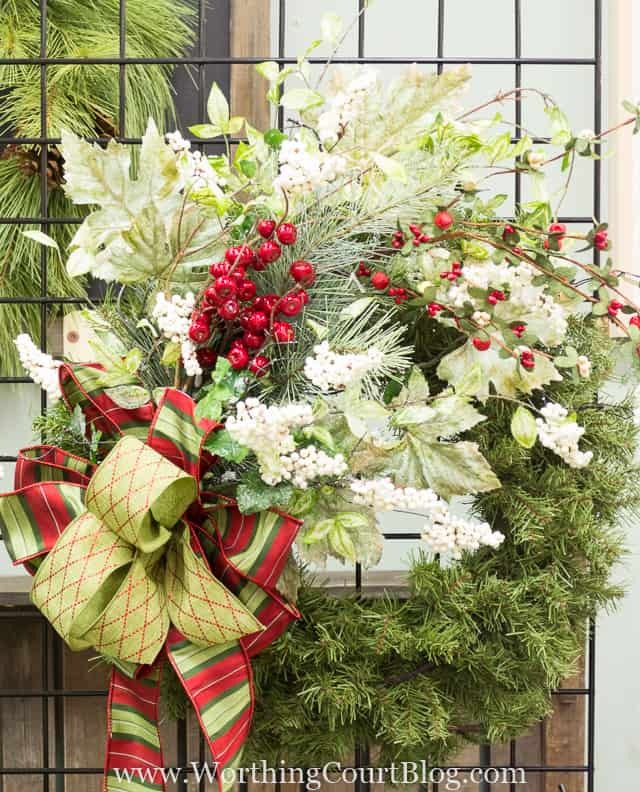 If you love the look of an expensive wreath, such as the really full ones with mixed greenery, then the only adornment that it needs is a beautiful bow. Let that gorgeous, expensive wreath shine. 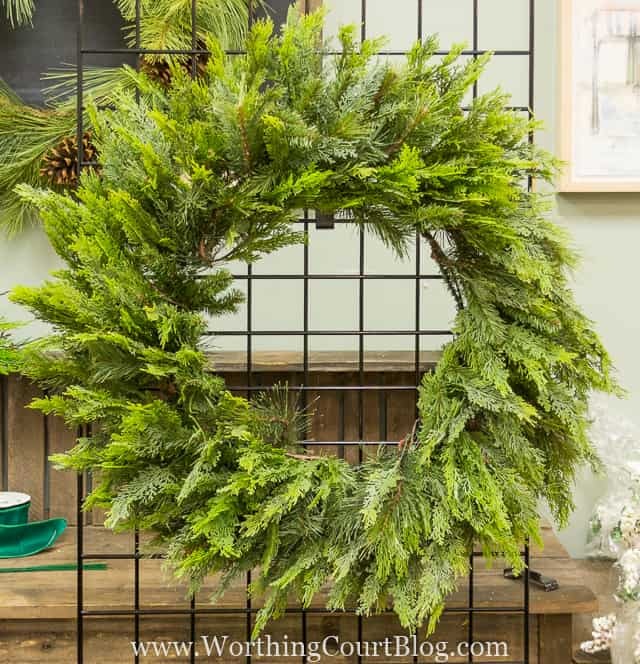 Other than the obvious fact that a faux wreath is much longer lasting than one with live greenery, one of nicest thing about using a faux wreath is that it does a lot of the decorating work for you. Those bendable branches are perfect for wrapping around branches and picks. 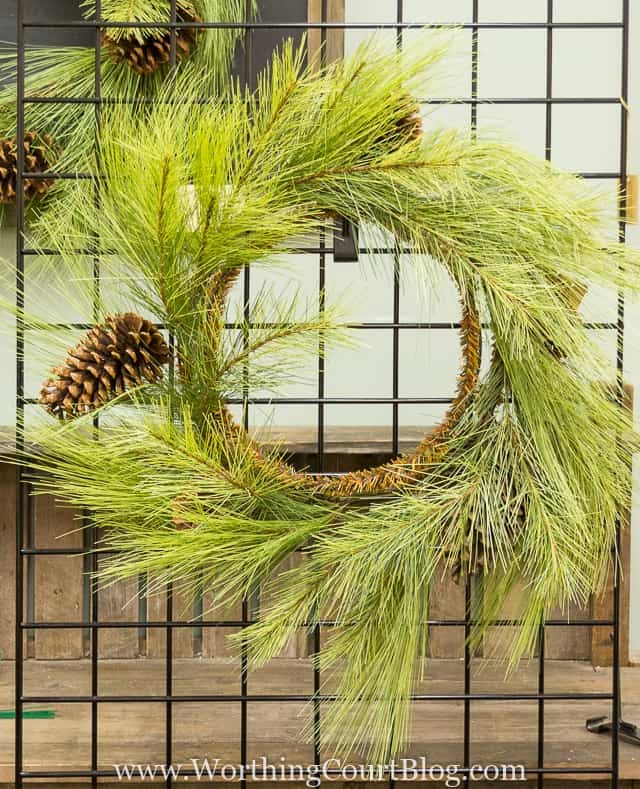 Use cable ties, instead of floral wire, to attach things to the wreath that can’t be held with one of the bendable branches. They’re easier to work with and are more secure. If you must use an adhesive, then hot glue is the best. 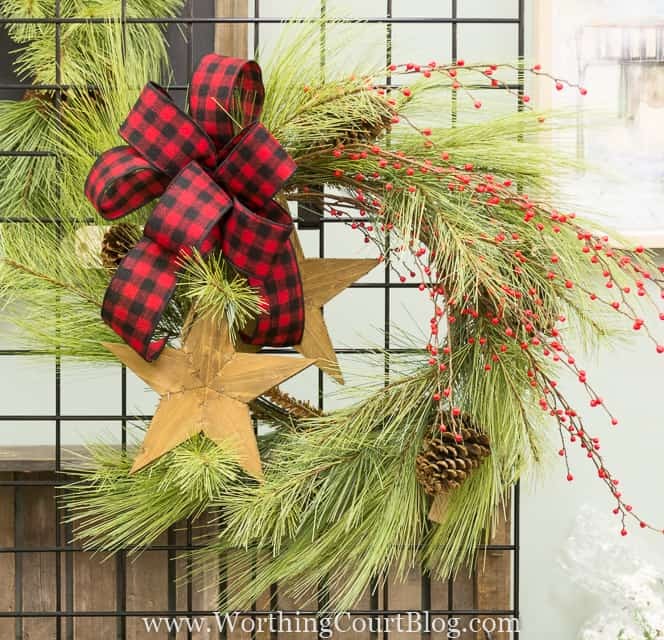 But – if you can avoid using any adhesive at all, the wreath is easy to take apart and redecorate next year! 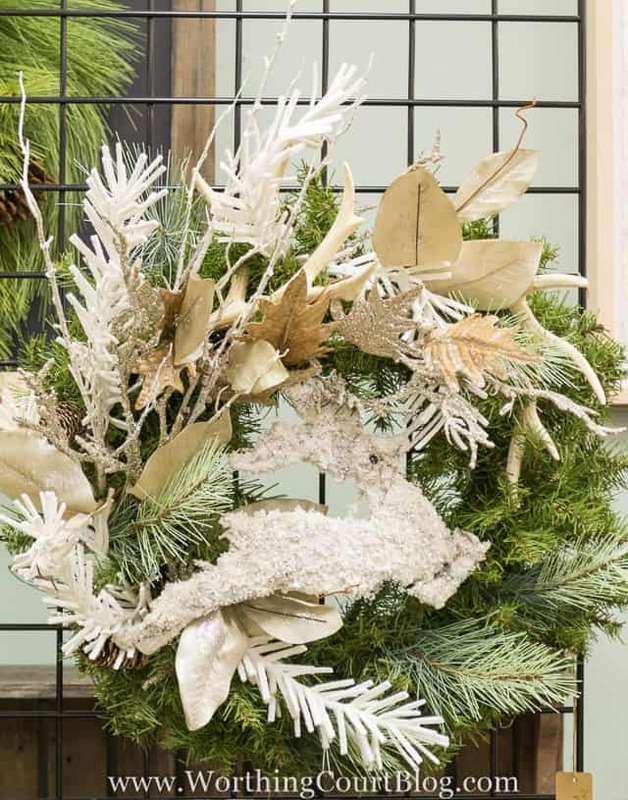 These general tips apply to decorating all types of wreaths, no matter the style or season. Get the specific step-by-step directions for actually decorating a wreath by clicking HERE. I am one of the worker bees at Total Bliss ~ and we have been anxiously awaiting your post about the time you spent with us. Your photos are absolutely gorgeous! We are all glad you could be there to see what a well-managed team can do in three days! I was honored to be able to spend time with all of you talented ladies. I learned so much from you! I am SO looking forward to your series!! Wow – what fun to be able to spend the time in the store while they were decorating it for Christmas! Looking forward to your posts…. What a fun opportunity to learn from the pros! Thank you for sharing with us at Snickerdoodle Sunday! Thank you Suzy for sharing these fabulous tips at Inspire Me Monday at Create With Joy – I’m delighted to feature you at this week’s party #204! Thank you for the feature! I’m honored. I hope you’ll find these tips helpful, Stacey! Enjoyed your post. Always eager to learn from the pros. I would like to know where they get the gorgeous ribbon? Thank you. Looking forward to more info!